I purchased this laptop, Acer Aspire S7-392 (buy online), a week or so after my previous laptop (Dell XPS M1330) stopped charging after 6.5 years of heavy usage and several upgrades. Next, I'll cover all aspects from the specifications of the laptop to the reasons why I bought it, plus periodic updates. About 4 years into using my previous Dell laptop, I had researched reliability and build quality of major laptop manufacturers and decided my next laptop (Ultrabook) would be an ASUS. My next laptop also wouldn't have an optical drive. Specifically, I wanted the Zenbook. I can't remember specifically, but it may have been the only option that met my requirements at the time. Oddly an Acer came along. I've always though Acer as cheap (both in price and quality), so I rarely gave it a second look. In fact, looking at the Acer Aspire S7 (S7-391) laptops were just hideous! 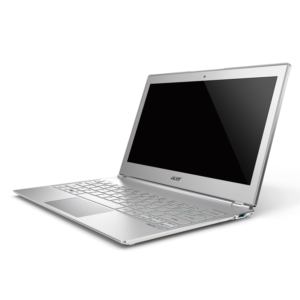 But the latest refresh of the Aspire S7 line (S7-392), according to the few available reviews had fixed previous problems (bulging battery, keyboard). From what I understand, all the parts of the Aspire S7 are permenant (RAM is soldered on with no additional slots and HD is permenant). I don't have any brand loyalty, so I decided to take the risk and purchase the Acer Aspire S7 (S7-392). I am hoping this laptop will last at least 5 years (through 2018). One major problem about this laptop was it was still retailed priced at around $1400. Given my current situation, my budget for a laptop was only around $1000 (several ASUS Zenbooks were priced around this range). I rarely buy anything, especially electronics used or refurbished, but in my recent goal to save money, I decided to take my second risk and purchase a refurbished unit from Acer's Ebay Store. The original unit was $1400, and it was being sold for $1050 (including tax and UPS ground shipping). This was right in my range and the Acer seller had good reviews 18900 reviews with 98.7% positive feedback. My logic was that since it was an Acer store, they would have higher standards than an end user reselling. I also assumed they checked for dead pixels. After purchasing (and paying with credit card via PayPal) at 10am, it was shipped with a tracking code by 4pm the same day. I was a bit confused because despite being purchased from an Acer account on Ebay, it was charged to and shipped by Liquidity Services. My assumption is Acer outsourced it to this company, and I didn't have any problem with it. UPS also managed to delivered it "With Signature Required" one day early! After the first day, I am overall very impressed. Despite being refurbished from Acer (via Ebay), the unit feels completely brand new! I'll elaborate more on each of these points in a later review after getting more usage, but here are my first impressions (remember my closest comparison with real world usage is the Dell XPS M1330). I also avoid talking about Windows 8 features. The Acer Aspire S7 as an awesome build quality. It is slim, yet overall feel in my hands is solid. I like the fact is is slim, yet still has essential ports (USB and full HDMI). The screen is clear and the touch screen is surprisingly more useful than I originally imagined. No ghosting of images like I've read on other reviews. Some of the keyboard buttons feel a bit sticky and one of the arrow keys is noisy, but still works. I've had no problem adjusting to the new keyboard. It is backlit, but not a feature I care much about (in fact, I would turn it off if I could). I dislike the key layouts. The entire row of F1 - F12 is gone (merged into the 1-10 keys). Bad for me since I use the F buttons as shortcuts in certain programs. A full click on the trackpad is noisy, but just a tap still works. The trackpad is also a bit large for my liking, which my palm sometimes touches while typing. Love the very fast processor (when compared to my old Core2Duo) and SSD. Boot up Windows 8 and Windows Updates (downloading, installing, rebooting) is very fast. Very odd/unique charging block that comes in 3 pieces. The middle piece being a cable extender of sorts. Only the end pieces are required. Laptop fan does turn on, but at the same frequency and loudness as my previous laptop. I like how the laptop fan in and out flow are both out of the back (and not the bottom). This way, I won't burn my lap when I'm using it on the couch. Dislike the fact the speakers are located on the bottom of the laptop. It feels like the sound is blocked by the table. - Metro (Start Menu) and search for "Control Panel" to open the original Control Panel window. - From the Control Panel, search for "Mouse" (in the searchbox in the upper right of the new window). - On the next window, click "Device Settings" tab. - Next, select "Synaptics ClickPad V8.1 on PS/2 Port" and click "Settings..." button. - A new window titled "Properties for Synaptics ClickPaid V8.1 on PS/2 Port" should popup. - Ensure that the "ZoomPerfect" checkbox is unchecked. - Find and highlight (don't uncheck the box) "Two-Finger Scrolling" and click the Gears icon to the right. - Uncheck "Enable reverse scrolling direction" checkbox. (If the checkbox is greyed out, you need to go back to uncheck "ZoomPerfect" before making the change. AFter he change, you can re-check "ZoomPerfect". - Use (Ctrl + F4) to close windows. - Use F5 (to Debug) and (Ctrl + F5) to run without debuging in Visual Studio shortcut. But there is not a Ctrl button (usually one on the left and right side of the keyboard) on the right side. This makes it difficult to use (Ctrl + Enter) to auto-compete a URL with .com and execute. Instead, the button there is the Del button, which in some cases causes more problems. Another complaint with the keyboard is the keys (all of them) are non-responsive unless they are fully depressed from or around the center of the key. If I click the very corner of the key softly, but fully depressed, the key isn't fully triggered. This is annoying when I quickly type in longer password, and for all sorts of typing and programming. Another odd thing (making the switch from Windows 7 to Windows 8 from a 6 year old laptop) is that the computer does not really shut down anymore! This may be a result of how Windows 8 is designed to enable fast boot up (or maybe an Acer specific change), but it messes with some installations that require reboots. After using the Acer Aspire S7 (S7-392-683) for a little more than one month, I have more feedback on my first perspective post. I general, my opinion is still positive. I do have some concerns that I didn’t notice in the first few days of usage, and some concerns I did not take into account before buying an Ultrabook. I still love the size and weight. Travelling with the laptop in a backpack takes up less space which allows me to pack other stuff. I managed to pack everything into a simple backpack for a one night trip out to San Diego during Christmas. With my previous 6 year old laptop (Dell XPS M1330), I would have needed a small hand bag. Another pro I missed relates to the screen. It is now much easier to clean the screen of dust, and my laptops all manage to gather lots of dust. The reason is the display and the frame around the display is one complete piece. On all previous laptops, the display frame was always placed above the display, so the edges of the display always tracked dust when “wiping clean”. Surprisingly, I find myself wiping down the screen more often and I find this as a nice pro. Though many reviews claimed the keyboard is improved from the previous model, I’d disagree that it is completely fixed. My experience with the keyboard it still misses keystrokes. A very obvious test is if I completely press the corner of any key, the keystroke isn’t recognized. I have to click squarely on the center of the key. I find that pressing harder also improves my odds. I can handle this when writing articles, but it is most annoying when typing passwords. The combination of on-screen keystroke being masked and typing faster is a bad combination for locking out accounts. The keyboard is my number one complaint about the Acer Aspire S7. The power button is positioned on the left side of the laptop next to the power port. Sometimes, the power cable jiggles itself loose and I have to re-adjust it. Due to the design of the plug, it can cause accidental power downs. I’ve never had a case of accidental power on, but that’s because the laptop automatically turns on when the screen is opened (and shuts down when closed). This is a minor issue and a quickly learned to avoid accidental shutdowns. Not related directly to the Acer Aspire S7, but instead indirectly via Ultrabooks with accessories soldered to the motherboard (to achieve small size), one thing I never took into account before purchasing is how to retrieve data from the hard drive if a laptop component other than the hard drive goes bad. Before, it is easy to remove the hard drive and connect it to any other PC. Not so easy anymore no that it is soldered.